A rebuilt piano from Piano Restorations is a sound investment in your family’s musical future. At Piano Restorations we guarantee that your piano will be in a condition indistinguishable from the equivalent new instrument but at a fraction of the cost. 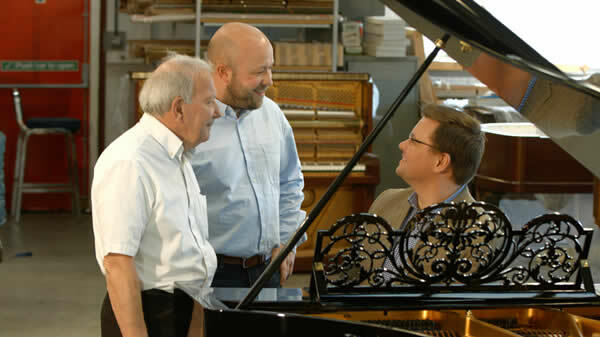 With over 160 years experience and training stemming back to Julius Bluthner himself, we are the market leaders in rebuild, restoration and innovation in pianos. A 190cm Blüthner grand piano for sale at £25,000, with a new action and keyboard, a new soundboard and tuning plank, completely refinished, and then regulated and set up to concert standard, in comparison, a new 190cm Blüthner retails for £58,000 (polished ebony) which is more than double the price. A fully rebuilt Steinway B from us, with a new Steinway action and keyboard, a new soundboard and tuning block, finished in black polyester and regulated to concert quality will sell for around £50,000 while the equivalent new piano costs £80,000. Even a restored Steinway B from Steinway Hall, which still has the original keyboard and soundboard (but with a new top action and strings) will have a retail price of close to £60,000. There are many piano restorers who are merely changing over the strings on the original soundboard and tuning plank, changing the hammer heads and damper felts, and repairing the external finish. While for a more modern piano this may be fine, for a piano of 40 years old and over we perform a full restoration. We are not assuming that all pianos this age and older require a full rebuild, but by the time a piano of this age is showing signs that it needs work, a full rebuilt is often necessary. We have found that in old pianos when the soundboard and plank is not replaced, the piano still sounds like a tired old piano even after replacing the other parts. Some of our customers have come to us to have their piano rebuilt again after another workshop has performed only a partial restoration that has left their piano in an unsatisfactory condition. Our rebuilt pianos enjoy a long life in the homes of many musicians, on the concert stage, in recording studios and institutions. In many cases our customers were prepared to spend far more on a new instrument, and in some cases our customers have gone on to purchase a second instrument from us with the money they saved on the first one! Our pianos will give you and your family decades of musical enjoyment, and they will last a lifetime. Having your piano rebuilt by us is a great way to ensure that your family heirloom is ready to be passed on to the next generation, and a piano purchased from us will surely be treasured for generations to come. Our pianos all come with a certificate of restoration detailing the parts used and the work performed, signed by our chief technicians, thus further ensuring the value of your instrument.